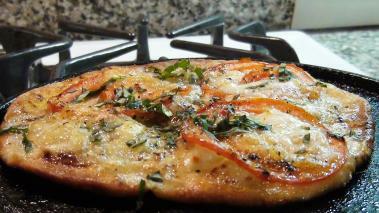 Pizza may top the list of all time greatest foods on Earth and I love making traditional pizzas at home. Here I show you how to make a Tomato & Basil Flatbread pizza that is so easy to make you won’t believe it, and everyone else will think you’re a professional chef. I make flatbread pizzas with pita bread, or sometimes naan, which is a ton easier than raw pizza dough. It also cooks very quickly, and in about 8 – 9 minutes you’ll be serving them up. This tomato and basil version is very traditional, but its really easy to change up ingredients and make different versions to suit your tastes. Allow it to rest for 2 – 3 minutes before serving…Enjoy! I generally love Chianti with pizza, and I think it’s still a great match for this flatbread pizza. However, because there isn’t a traditional sauce on this flatbread, I think even a white, like a chardonnay would go very well.